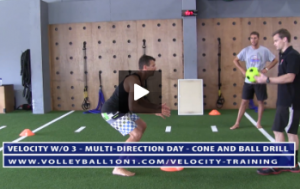 This series of 14 videos features a Multi-Directional Workout filmed at Velocity Newport Mesa with Sports Performance Coach Chase Cameron. This is the third of 3 workouts filmed at Velocity Sports Performance. The other workouts were a Linear Training Day and a Jump / Landing Day. For those of you looking for live in person training with velocity contact them directly at the link above. Chase and the rest of the Velocity team train allot of top volleyball players including Pro AVP players like Ed Ratledge. They work with volleyball players of all ages and skill levels including; junior high, high School, college and professional athletes.